This is the default FAQ archive description. As a precaution, drinking the water directly from faucets in not advisable. Convenient stores are plentiful throughout Veracruz where you can purchase bottled water. On our multi-day trips, your local trip guide will have purified water on board the tour vehicle for you. In Veracruz, the majority of the people you encounter at hotels, restaurants, stores, and on the street will only know Spanish. Your local bilingual trip guide will be there to help you with reading signs, menus, and any other translations needed. However, it is always good to know some basic words in Spanish. The local people will appreciate you for at least trying to speak a little Spanish. How do I get to the city of Veracruz? Many airlines have flights to México City. From there you can change planes for the 60 minute flight to Veracruz. There are some airlines that fly direct to the city of Veracruz from Houston, Texas (2 hours). The airport code for the Veracruz International Airport is VER. If you are already in the country of México, you can find comfortable buses that will take you to the main bus station in the city of Veracruz. From México City, you can take a bus from the company called, ADO. How do I reserve a trip (custom)? To reserve space on our tours with advertised trip dates, please use our online reservation system. To book our advertised tours but with a request for a different trip start date, please give us a call or complete our online information form. We will check availability for your requested dates and get back with you quickly. Our online advertised trip fees for our multi-day tours are based on a minimum of 4 to 6 people to make the trip go. Specific details on minimum and maximum numbers of people are listed in the information for each of our advertised multi-day tours. Most of our online advertised trip fees for our one day tours from the city of Veracruz are based on a minimum of 1 person to make the trip go. Specific details for each of our one day tours can be found in their tour details. Many of our tourscan accommodate larger groups as we will then secure comfortable and modern coach tour buses for transportation during the trip. Please contact us for specific details and pricing. Credit Cards – Contrary to the advertisements you may see regarding credit card acceptances worldwide, that is not always true. Many of the smaller stores and even some of the bigger stores in Veracruz do not accept all credit cards and some do not accept any of them. Most likely, your international Debit Card will not be accepted at all. Cash is still king in México. In Veracruz it is Mexican Pesos and not US dollars or other foreign currencies which are accepted. Yes, you will have to exchange you foreign currency into Mexican Pesos either before you arrive or at an ATM after your arrive. Your local host guide can assist you with your money exchange. With advance notice, we will do our best to accommodate your special dietary needs. In some destinations the choices may be slightly limited, but with some creativity from the restaurant chef, you should be able to enjoy delicious meals suited to your requirements. Is tipping common place in Veracruz? Yes, in most places tipping is expected. The word TIP means, To Insure Promptness. Tipping is not included in the tour price except for meals listed on the itinerary. The exception is with larger groups where we usually do include all tips in your tour fee. Tipping is at your discretion. Your tour guide can give you recommendations on an amount which is appropriate based on each situation. When you book one of our tours, we will email you suggested tipping amounts for your tour guide and driver. To travel independently, you must be at least 18 years of age. There are no upper age limits on our tours. However, travelers 65 and older are required to complete a medical form. Many of our more “soft adventure” tours have special trip pricing for children 6-17 years of age. There are no trip costs for children under 6 years old. On our more challenging adventure trips, the minimum age is 16 years old. 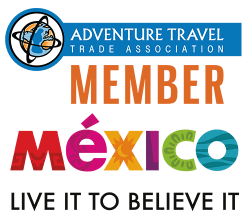 After you sign on to one of our trips, you will receive a list of suggested items to pack based on your particular trip and the time of the year you are coming to Veracruz. What is the weather like in Veracruz? The state of Veracruz has a tropical climate which is mostly hot and humid in the eastern coastal plains area found along the Gulf of México. In the western foothills of the Sierra Madre Oriental Mountains, the weather is cool and somewhat humid. Up in the higher altitudes of the mountains, it can get “wintery” cold. The rainfall mostly occurs in the summer months with 2/3 falling between June and September. Winters are usually dry with mild winds. The port city occasionally has strong north winds (nortes) that blow down the coast. A deposit of $350 USD per person is due when you submit your reservation. Full payment is due 70 days prior to the first day of the trip. Payments made within 30 days of the trip need to be in the form of a certified check or credit card. What types of hotels will I be staying in on my tour in Veracruz? In the major Veracruz cities, we generally have our travel guests stay in clean and comfortable 3-4 star hotels. In the smaller towns your may visit, we use the best 2-3 star hotels available with basic amenities. And yes, you may find little geckos occasionally darting up and down your hotel walls. They are harmless and just add to the flavor of your trip.